Posted by Toy Lady in baking, random stuff. 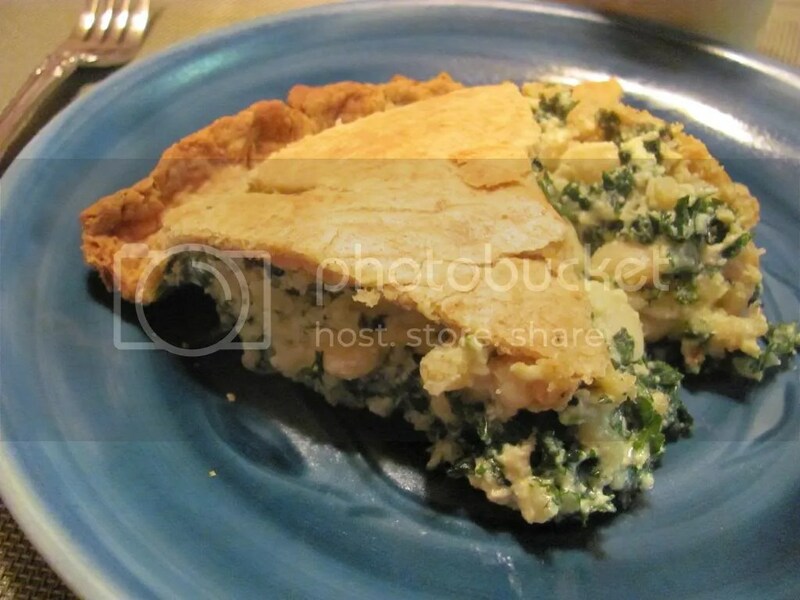 Tags: and it's healty too!, I love beans, I love kale, meatless, PIE! A long, long time ago, I had a very dear friend who was a vegetarian. I don’t know why Deb was a vegetarian, whether it was for health reasons, or moral concerns, or what, but in all the years I knew her, as far as I know, no meat (not even bacon!) ever passed her lips. In fact, I believe she even fed her dogs a diet of scrambled eggs and veggies! 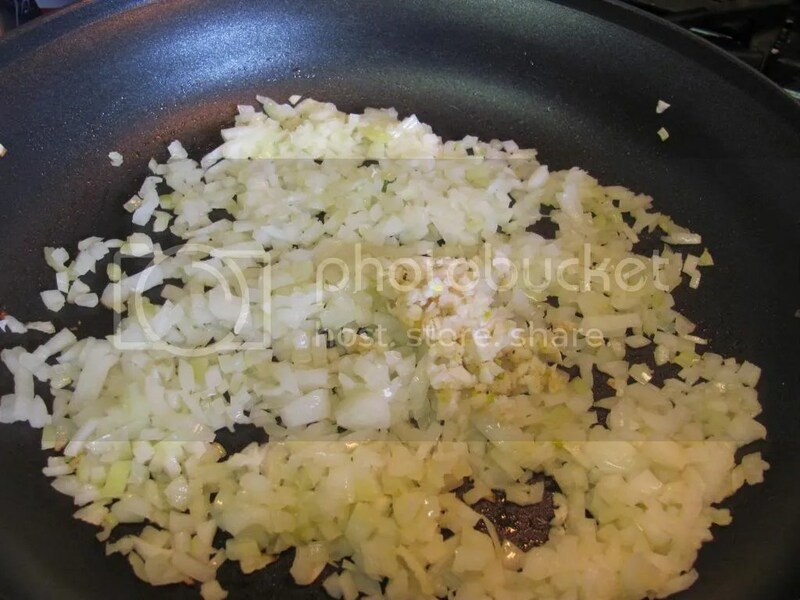 I’d never really cooked for a vegetarian before – I mean, what do you feed them? Bean sprouts? Salad? Baked potatoes? And Deb was no help – she was kind of a “grab something from the frozen section” kind of gal – she even ate those “Not Dogs” and stuff! So I knew, if I invited her, she’d appreciate a home-cooked meal – if I could only figure out what to cook! Well, it took me a bit to figure out something that we could both enjoy (we all know how I feel about fake food!) – after all, this was before the internet was around and Meatless Mondays became All The Rage! So I dug through my “favorite” recipes (I wasn’t going to make my friend something I didn’t like myself! ), and I decided on this wonderful pasta dish. It’s fantastic, and actually, now that I’m thinking about it, I think I’m going to need to make it again soon! It’s got tomatoes and white beans and artichoke hearts and sausage. Obviously, I had to do something about the sausage – something that didn’t have “soy” in its name (see above about fake food). So I thought about it some more and decided to swap out the sausage for (wait for it!) eggplant. Well, what I did was I tossed the eggplant – one of the most vegetarian of vegetables, I think – I tossed it with a bit of flour and lots of seasonings – Italian seasonings. I think I had some sage and some fennel and some crushed red pepper, maybe even a little parm. Basically, I breaded the eggplant, browned it, and pretended it was sausage. No, pretend meat is not the same thing as fake food. My friend loved it. She loved the fact that I’d made the effort, yeah, but she actually enjoyed the food, too! I was so proud of myself – I’d taken a meat-heavy dish, tweeked it, and fed it to a vegetarian! I was thinking about Debbie the other day – I went looking in the archives for a “meatless” recipe – these days, we try to go meatless once a week. 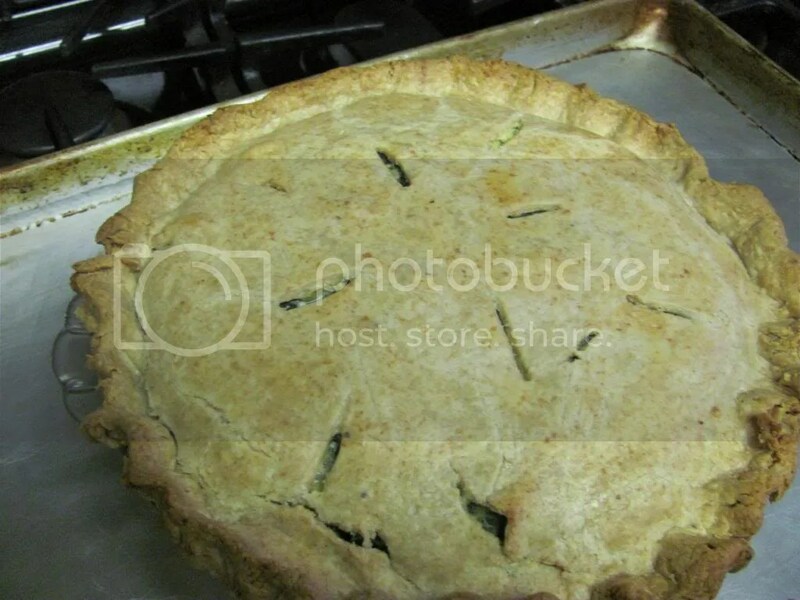 And in the folder, I found this recipe for a Swiss chard, ricotta and sausage pie. I have no idea what it was doing in the “meatless” file, but there it was, sausage and all! 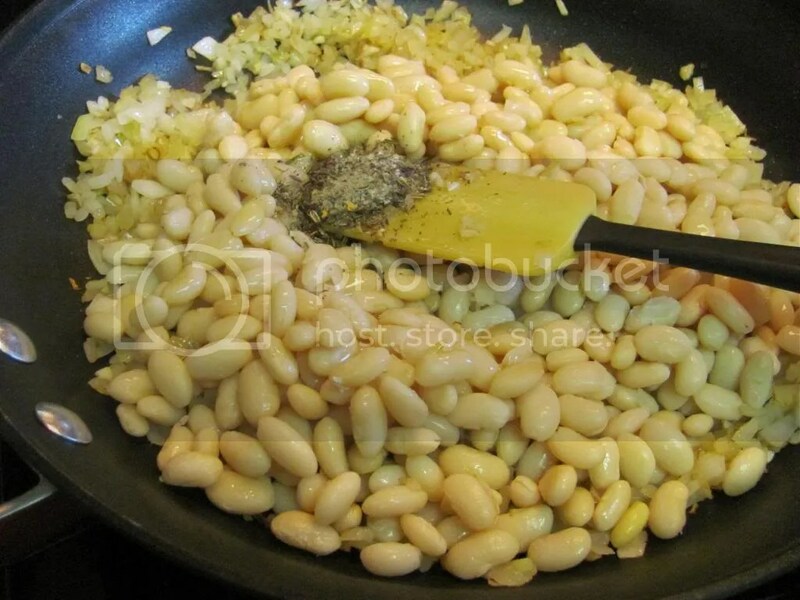 So what we did was we swapped out the sausage for beans – slightly mashed, well-seasoned beans – and a bit of extra virgin olive oil. After all, one of the things sausage has going for it is that it’s not dry. Mashed beans . . . not so much. 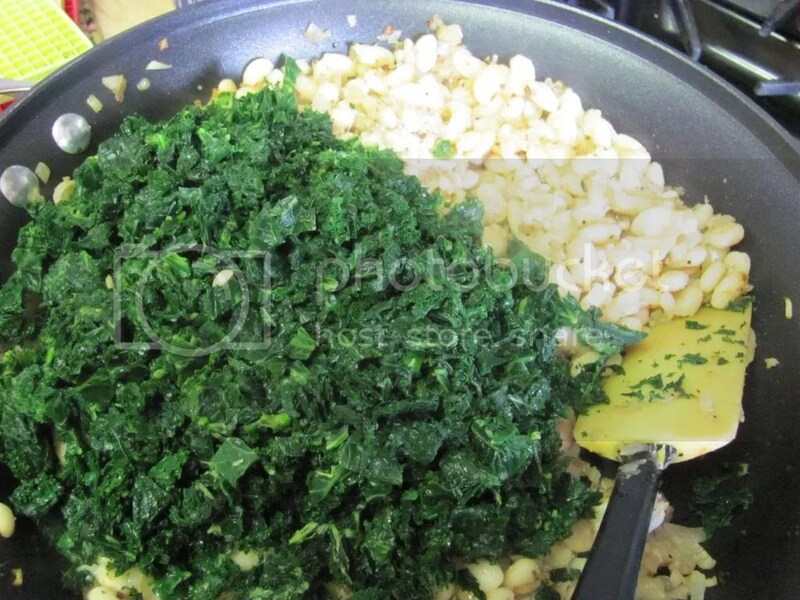 We also had a mess of kale in the freezer – no need to buy chard! Plus, kale is my favorite green these days! I wanted something a little more exciting than a plain pastry, though – after all, seasoned or not, I was giving up a lot of sausage-y goodness for beans. We need flavor, darn it! Plus, with the beans and kale, I wanted it to at least feel healthy, you know? We whomped together this crust – whole wheat flour (extra points for being healthy), parmesan cheese and a bit of garlic (now that’s not boring!). 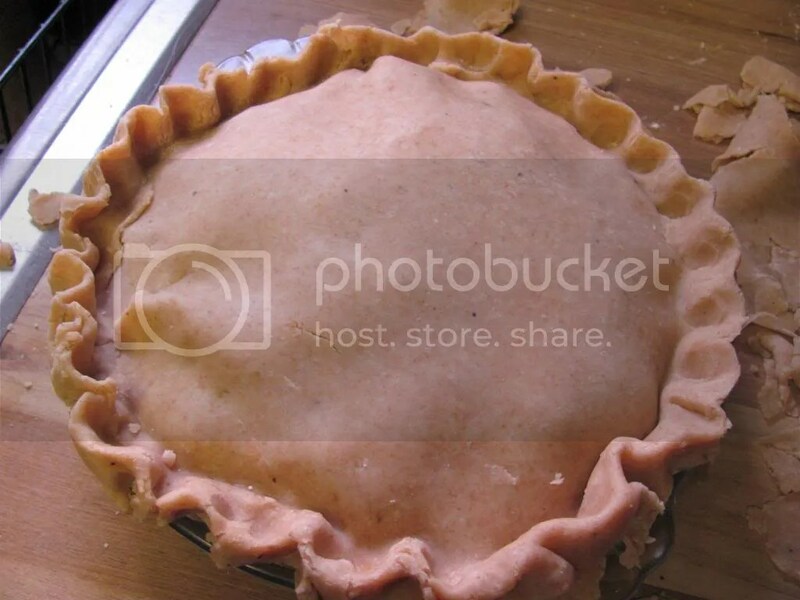 And as an extra bonus, the crust that I trimmed from the pie was used as “pill pockets” for the Jar’s pills – he does take 7 pills a day, you know! So all in all, I’ve got to say I was pleased with this pie. It was very good – and it was just as good reheated, which is a good thing, because it was lunch for, I think, 3 days for me! I might, if they were in season, chop a couple of fresh tomatoes and add them to the filling, but I wouldn’t miss them if they weren’t there (which they weren’t). 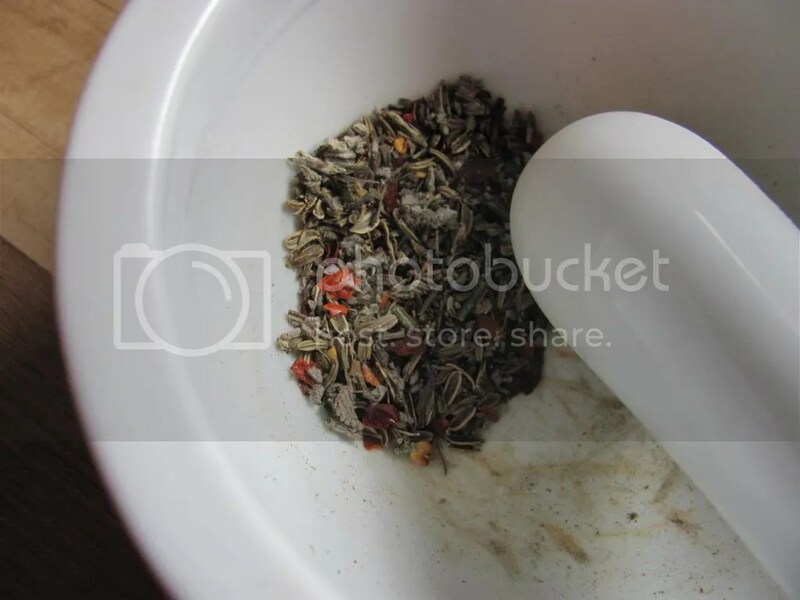 Go ahead and take a look at this printable recipe – I think it’s a great place to start. 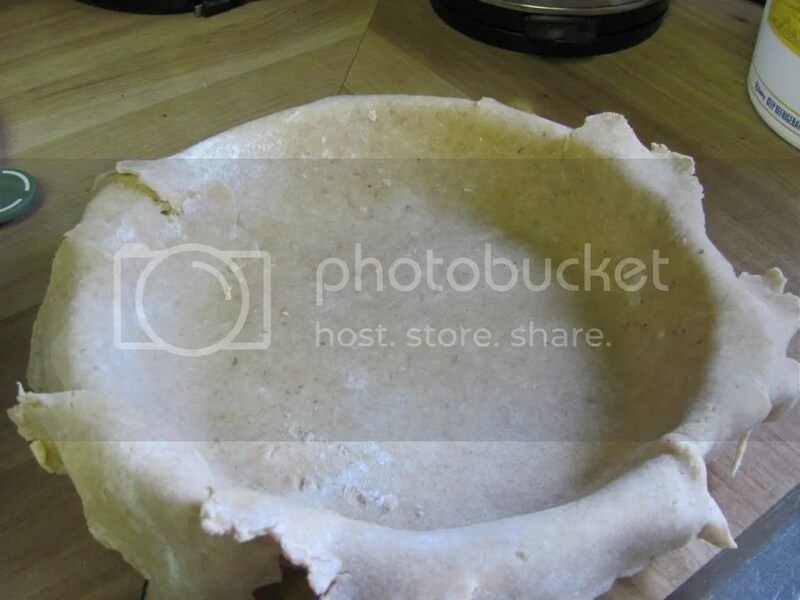 Mine won’t look as gorgeous as yours, because I have a *thing* with pie crust. But I’ll try it, and at least the insides will be good! And I have some cooked great northern beans in the freezer just begging to be used. Sure, Anne. The alcohol makes the crust a little easier to work – there was a Cook’s Illustrated article a while back explaining all the science-y stuff about gluten formation and, um, stuff. But ice water will work just as well. Looks really good and I am sure it tasted great too. Interesting read.